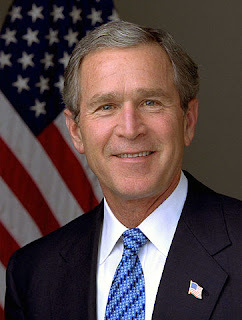 George Walker Bush was the 43rd President of USA who remained at the seat from 2001 to 2008. During his tenure, America faced the most drastic situation of internal security when hijackers killed around 3,000 people in USA after attacking World Trade Center and Pentagon in 2001. Later, he stared War on Terror after which he invaded Afghanistan in 2001 and Iraq in 2003. His invasion of Iraq was one of the most controversial attacks and later proved a disaster not only for USA and Iraq but also for the whole Middle East. George W Bush was born on 6th July 1946 in Connecticut. He was the son of 41st American President George Herbert W Bush and Barbara Pierce. He took his B.A degree in History from Yale University and M.B.A from Harvard Business School. In November 1977, George W Bush married a librarian and school teacher Laura Lane Welch. George Bush started his political career in 1978 when he lost the elections of Texas’s 19th congressional district. Later, Bush ran the presidential campaign of his father in 1988 and 1992. George W Bush remained Governor of Texas from 1995 to 2000. Bush became the presidential candidate of Republican Party for 2000 election after defeating other main candidate John McCain. Bush won the Presidential election against Democratic Party’s candidate Al Gore. It was a controversial election as the result of Florida was announced in favor of Bush after recounting on the orders of U.S. Supreme Court. Later in 2004, Bush against contested presidential election as a candidate for Republican Party. George Bush was elected President of USA for the second consecutive time despite the opposition he faced on the destructive Iraq War. After September 11 attacks in 2001, President Bush announced War on Terror in order to punish the culprits of the attacks and their supporters. US invaded Afghanistan along with its allies in October 2001 after Taliban refused to hand over Osama bin Laden to USA. Taliban were soon defeated and a government was set after elections but the guerrilla war by Taliban made it impossible for US to exit its forces from Afghanistan and instead Bush had to increase the size of US military in order to quell the resistance from Taliban. The most controversial decision by George Bush was the invasion of Iraq in 2003. Despite opposition from most of the world, President Bush decided to invade Iraq on the ground of preemptive strike against a country which was among the axis of evil according to his Bush Doctrine. The main argument in favor of Iraq war was the presence of Weapons of Mass Destruction (WMD) in Iraq but the UN Inspection Team could not verify these claims. But Bush, his administration and military commanders had already made their mind about the start of another Iraq War. The war started on 20th March 2003 and the Iraqi regime of Saddam Hussain fell in less than a month. But the guerrilla war after the main war proved many times more lethal than Afghan guerrilla war with the loss of around 5,000 coalition troops and many hundred thousand Iraqis. Despite the formation of a new Iraqi government in 2005 after general elections, peace could not be restored fully while the elections paved the way for a sectarian conflict in Iraq. Another important event during the era of Bush was the brutal treatment of prisoners by the jail authorities in the prisons of Guantanamo Bay (Cuba) and Abu Ghraib (Iraq). The prisoners of war and other suspected persons were interrogated by using severe torture techniques e.g. waterboarding while its use was authorized by Bush administration for CIA. The publication of images of torture in Abu Ghraib prison enhanced the hatred against American troops in Iraq and defamed the image of USA around the globe. Few culprits of these abuses and torture were given punishment later. The worst recession in US after Great Depression of 1930s started in December 2007 and reached at peak in 2008. During this crisis, more than 2.5 million people lost their jobs and the Bush administration had to take serious measures to somewhat reverse the situation including signing of billions of $ bailout package and takeover of Fannie Mae (FNMA) and Freddie Mac (FHLMC). Hurricane Katrina in August 2005 was the major natural disaster during Bush era. Around 2,000 people lost their lives while New Orleans (Louisiana) was the most affected area. The government was badly criticized for its negligence and delayed response on the issue. Wars in Afghanistan and Iraq are the two major events occurred during the reign of George W Bush. The war in Afghanistan was fought after the 9/11 attacks but there was no appropriate reason to invade Iraq in 2003 especially when there was also no confirmation of weapons of mass destruction (WMD). The only purpose behind this invasion was to use the sympathies of September 11 attacks to accomplish the desire of occupying an oil-rich country (Iraq). This decision proved disastrous not only for USA and Iraq but also for the whole region of Middle East. Thousands of US military personals and millions of Iraqis lost their lives in the conflict while the experiment of democracy initiated the Iraqi civil war on sectarian lines after the establishment of an Iranian-backed Shia government of Noori al Maliki. The Iraqi invasion of Bush also gave birth to al-Qaeda in Iraq (AQI) which later transformed into the most dangerous terrorist organization Islamic State of Iraq and Levant (ISIL). Both these wars destabilized the neighboring countries of Afghanistan and Iraq while USA also suffered economically due to these conflicts as these wars were also a reason of the economic recession of 2008.